Country will likely have to make changes in its fiscal system, commercial policies and the rules of intellectual property protection to adapt to the standards of the international entity. RIO DE JANEIRO, BRAZIL – Brazil’s President Jair Bolsonaro has agreed that the country will give up the differential treatment that developing countries receive at the World Trade Organization (WTO) in exchange for US support for Brazil’s entry to the Organization for Economic Cooperation and Development (OECD). Presidents Jair Bolsonaro and Donald Trump shake hands at the White House after two days of meetings, photo by Alan Santos/PR. 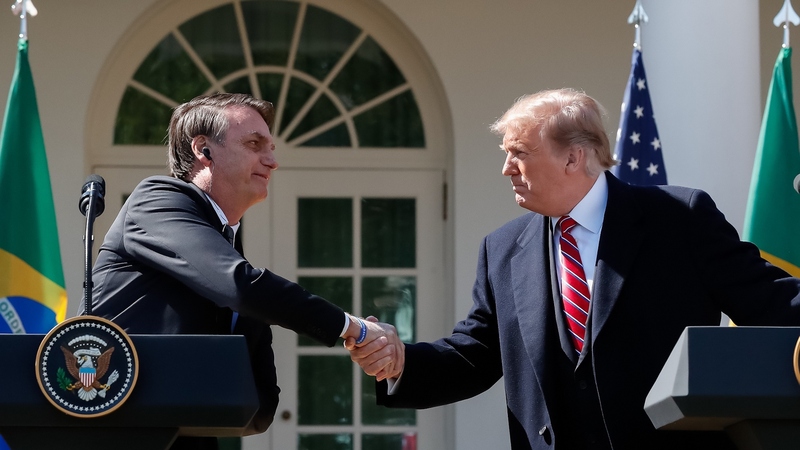 “The American support for Brazil’s entry into the OECD will be understood as a gesture of recognition that will further mark the union we seek,” Bolsonaro said in a statement to the press after the meeting on Tuesday with U.S. President Donald Trump. The news of ‘the trade’ was seen as positive by many business people and public figures. “Brazil has made great strides in converging policies to participate in the OECD. It is the non-member country with the highest adherence to the instruments of the organization,” said the National Confederation of Industries’ (CNI) Commercial Policy Manager, Constanza Negri in a press conference at the CNI headquarters in São Paulo. According to Negri will likely have to make changes in its fiscal system, commercial policies and the rules of intellectual property protection to adapt to the standards of the international entity, but it will be worth it. “The challenges are great, but access to the OECD is an opportunity for the institutional modernization of Brazil and for the implementation of the structural reforms long defended by the industry,” added Negri. For Ambassador José Alfredo Graça Lima, Brazilian negotiator when the WTO, the demand by the U.S. that Brazil give up its differential treatment status at the entity to enter the OECD, is “reasonable”. “Brazil has never ceased to be part of the informal group of developing countries, but the benefits of differential treatment are practically zero in our case. One of the only sectors where there is effective special treatment is agriculture, and Brazil does not need it,” Ambassador Graça Lima is quoted as saying by online news company, UOL. “The issue of differentiated treatment in the WTO today is much more political than economic. Brazil is an agro-environmental power, the less subsidies and protection there are, the better it is for us,” added the ambassador.